Tower Hamlets Council has not given Peabody “planning permission to demolish the existing buildings”. This suggests that a normal planning application has been made, put out to public consultation and determined by officers or a committee of councillors. Officers have simply given “prior approval of the method of demolition” in response to Peabody’s application for “prior notification of demolition”. Peabody probably made this application to stop the campaign’s efforts to save the two cottages. Knowing that the demolition site would not require an Environmental Impact Assessment. And, because officers would be obliged to approve (without consultation) the contractor’s method of demolition, Peabody could demolish the buildings and then make a planning application for their residential scheme on the cleared site. All this without any opportunity for councillors, residents and others to comment on the desirability or otherwise of keeping some or all of the buildings and adapting them for re-use (as required in the Council’s 2008 planning statement). This suggests that Peabody’s scheme would be 100% affordable, as indeed they told officers in pre-application discussion. In fact, we understand that the scheme would provide 33 new homes: 9 for sale on the open market, 11 for shared ownership and only 13 for affordable rent. the scarce built evidence of the Jewish East End, and of the fact that the East End is renowned as a historic point of arrival for migrants from all over the world. And, that converted to much-needed affordable family homes, they would be a living memorial to a unique maternity hospital. Especially as the Council recognised, in its screening opinion on the need for an Environmental Impact Assessment, that all four buildings on Underwood Road are “non-designated heritage assets, in accordance with PPS5”. This means that the Council has a duty to protect them as part of the historic environment and Peabody should be assisting the Council in fulfilling its statutory duty. Peabody’s new residential scheme would only become part of London’s heritage should it include the two cottages. possibilities explored, Peabody’s architects produced an Option 3, which would keep the two cottages. 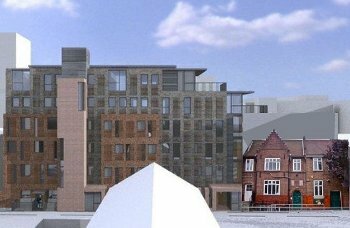 The campaign thinks this is a well-designed scheme and has suggested to Peabody that this could also be a viable scheme if an extra storey was added to the proposed five-storey block on Underwood Road. The campaign has not asked for the retention of the facades, and is completely opposed to this fundamentally dishonest approach. The cottages could be family houses by the building of back additions for, say, bathrooms and kitchens. Option 3 includes a more than generous provision of amenity space behind the cottages and the proposed five-storey block on Underwood Road. Back extensions to the cottages would only take up a very small part of this amenity space. Dr. Sharman Kadish, Director of Jewish Heritage UK, was given a written assurance that this would not take place. It is very good of the Squibb Group to accept responsibility, but surely an organisation of Peabody’s size and experience would have procedures in place to ensure that promises are kept. Demolition was also “premature” in that it was started without a demolition notice being sent to the Council’s building control officers. 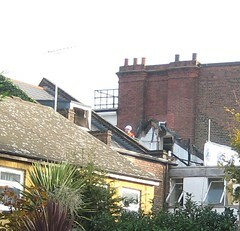 It was as a consequence of this failure that Owen Whalley urged Peabody to stop the demolition of the 100-year-old cottage at 24 Underwood Road. This is the case, as no amount of commemoration would substitute for actual built evidence. The former Jewish Maternity Hospital was, after all, the only Jewish maternity hospital in England (see also 3. above). The fact that historic buildings have not been “occupied or used for some time” is no justification for their demolition. Nor is the ridiculous claim that they give “no indication of its history” – few historic buildings do. An application to list the former Jewish Maternity Hospital was made by Tom Ridge, but this was refused by English Heritage, by letter dated 23 April 2010. Their refusal is being used by Peabody Housing to justify their demolition of all the buildings at 22-28 Underwood Road. Just because they are not sufficiently grand to be listed by English Heritage does not mean they have little or no architectural interest. In fact, Tower Hamlets Council has recognised that all four buildings on Underwood Road are “non-designated heritage assets”. English Heritage also failed to acknowledge that the buildings constitute the only former Jewish maternity hospital in English. 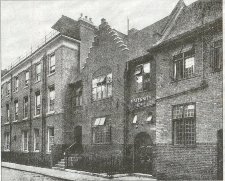 of Alice Model, and as a rare Jewish welfare building in London’s East End”. In fact, the building is the only purpose-built example relating to the work of Alice Model. And it is the largest of the three surviving former Jewish welfare buildings, and the only hospital. A unanimous vote by Councillors at last night’s Full Council Meeting called on the Mayor of Tower Hamlets to urgently negotiate with Peabody Housing. Also, for Peabody Housing to reconsider their designs to spare the cottages. The motion was proposed by Councillor Judith Gardiner (Labour) and seconded by Councillor Helal Uddin (Labour). The motion noted that Peabody has a duty to optimise the amount of housing they provide but also to protect the Borough’s heritage. Councillor Peter Golds (Conservative) spoke in support on behalf of his group. Before the motion was put, Councillor Rabina Khan (Lead Member for Housing) responded to the campaign’s earlier presentation saying that the Council endorsed the campaign to keep the two cottages as two much needed affordable family homes and as a living memorial to a unique maternity hospital. Councillor Khan referred to her member’s enquiry earlier this year, which revealed that Asset Management had sold the former Jewish Maternity Hospital to Peabody on 31 March 2011. She added that she would be writing again to Peabody. The Campaign’s presentation was given by Melissa Parker, who said that the two cottages were a “vitally important part of the scarce built evidence of the Jewish East End, and of the fact that the East End is renowned as a historic point of arrival for migrants from all over the world”. In answer to a question from Councillor Bill Turner (Labour), Tom Ridge explained that Peabody’s architects had produced an option 3, which retained the two cottages but would only provide 26 rather than 33 homes. Peabody has said that some or all of the necessary seven homes could be provided in an extra storey on their proposed five-storey block, but that planning officers would not let them. The campaign thanks all the Councillors for their magnificent support and believes that planning officers have a statutory duty to encourage Peabody to retain the two cottages as “non-designated heritage assets”.